Look up brick and mortar in Wiktionary, the free dictionary. This article is about the e-commerce concept. For brick and mortar construction, see Brickwork. For other uses, see Brick and mortar (disambiguation). 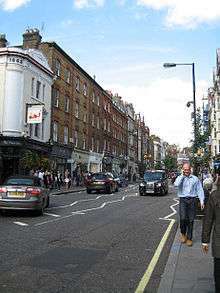 Brick and mortar retail stores on Marylebone High Street, London. Brick and mortar (also bricks and mortar or B&M) refers to a physical presence of an organization or business in a building or other structure. The term brick-and-mortar business is often used to refer to a company that possesses or leases retail stores, factory production facilities, or warehouses for its operations. More specifically, in the jargon of e-commerce businesses in the 2000s, brick-and-mortar businesses are companies that have a physical presence (e.g., a retail shop in a building) and offer face-to-face customer experiences. This term is usually used to contrast with a transitory business or an Internet-only presence, such as fully online shops, which have no physical presence for shoppers to visit, talk with staff in person, touch and handle products and buy from the firm in person. However, such online businesses normally have non-public physical facilities from which they either run business operations (e.g., the company headquarters and back office facilities), and/or warehouses for storing and distributing products. Concerns such as foot traffic, storefront visibility, and appealing interior design apply mainly to brick-and-mortar businesses rather than online ones. Nevertheless, even an online-only business needs to have an attractive, well-designed website, a reliable e-commerce system for payment, a good delivery or shipping service and effective online marketing tactics to drive web traffic to the site. Governments are also adopting e-government approaches, which is the use of online services for citizens to enable them to fill in government forms, pay tax bills and register for government programs online; these services aim to cut bricks and mortar costs (building leasing/purchase and staff costs) and improve services to citizens (by offering 24/7 access to information and services). The divergence between brick-and-mortar businesses and online businesses has expanded in the 2000s as more and more entrepreneurs and established organizations create profitable products known as web "apps" (software applications) and mobile apps. Many web and mobile apps are digitally distributed to customers online and offer value without delivering a physical product or direct service, thereby eliminating the need for manufacturing products, warehousing them, and distributing them using shipping and delivery services and/or physical retail outlets. As well, due to the shift to digital media in audio and video, stores are able to sell digital audio files of songs or digital movies or TV shows over the Internet, either by selling the file to the customer or allowing, for a subscription fee, the consumer to "stream" the songs, movies or TV shows to their digital device. Furthermore, the advent of reliable, affordable remote business collaboration tools such as teleconference phone systems and videoconferencing systems (e.g., Skype) diminishes the need for physical business buildings and offices for many Web and mobile product businesses. Some stores have both a strong bricks and mortar presence and extensive online shopping services. Examples include Best Buy, Walmart, and Target. While these stores are primarily known as brick-and-mortar businesses, they also have major online shopping websites. In the 2010s, the presence of online stores is adversely affecting some bricks and mortar-only businesses, as some customers are engaging in "showrooming". Customers who are "showrooming" go to a local bricks and mortar store's showroom to test and try out products, and then note the brand and model number, and leave the brick and mortar store and then buy the product from an online store, often for a lower price. Some bricks and mortar stores state that this trend is decreasing their sales. The name is a metonym derived from the traditional building materials associated with physical buildings: bricks and mortar. The term was originally used by 19th century British novelist Charles Dickens in the book Little Dorrit. The term brick-and-mortar businesses is also a retronym, in that most stores had a physical presence before the advent of the Internet. The term is also applicable in a pre-Internet era, when contrasting businesses with physical retail presence with those that operated strictly in an order-by-mail capacity pre-Internet. A fruit stand at a village market in Afghanistan. The history of brick and mortar businesses cannot be dated precisely, but it existed in the earliest vendor stalls in the first towns, where merchants brought their agricultural produce, clay pots and handmade clothing to sell in a village market. Bricks and mortar businesses remain important in the 2010s, though many stores and services, ranging from consumer electronics shops to clothing stores and even grocery stores have began offering online shopping. This physical presence, either of a retail store, a customer service location with staff, where clients can go in person to ask questions about a product or service, or a service center or repair facility where customers can bring their products, has played a crucial role in providing goods and services to consumers throughout history. All large retailers in the 19th and the early to mid-20th century started off with a smaller brick and mortar presence, which increased as the businesses grew. A prime example of this is McDonald’s, a company that started with one small restaurant and now has nearly 35,000 restaurants in over 110 countries and plans to grow further; this shows the importance of having a physical presence. For many small businesses, their business model is mostly limited to a bricks and mortar model, such as a diner restaurant or a dry cleaning service. Nevertheless, even service-based businesses can use websites and "apps" to reach new customers or improve their services. For example, a dry cleaning service could use a website to let customers know of the hours and location(s) of their bricks and mortar stores. The increase in households where both adults work outside the home, combined with the convenience of shopping for and buying products and services online, has decreased the number of customers going to retail outlets, as consumers can access the same information about products and services without paying for gas, parking and other costs, thus saving them time and money. "Today’s consumers lead busy lives and [Bricks and Mortar] shopping takes time. Often it is a [challenging] task. Consumers find researching and shopping on the Web far more convenient than brick-and-mortar visits." Another example of this is the introduction of online banking, which has affected bank branches on the High Street: "Barclays will shut at least 50 [Bricks and Mortar] branches this year." Brick and mortar businesses are not limited to having a physical presence only, they may also have an online presence such as Tesco, who offer an online grocery service as well as a brick and mortar retail presence. Customer service: face-to-face customer service can be a big contributor into increasing sales of a business and improving customer satisfaction. When customers can take a product back to the store to ask staff questions or help them learn to use it, it can make customers feel more satisfied with their purchase. Research has shown that 86% of customers will pay more for a product if they have received great customer service. Face-to-face interaction: Baby Boomers, older Generation X customers and the elderly are used to a more traditional in-person approach when it comes to shopping and prefer to have a demonstration of products or services, especially when buying new technology. Research has shown that customers from these demographics prefer to touch products, and experience and test them out before they buy. The brick and mortar approach also has various drawbacks. Fixed costs are a serious challenge for B&M businesses. Fixed costs are payments that a business has to make for elements such as rent of a store and monthly payments for services such as a security alarm. Fixed costs stay the same for a business even if it ramps up its operations or winds down its operations during a slow period. In contrast, variable costs change as a business ramps its operations up or down. Variable costs include wages (for employees paid by the hour) and electricity. If a business increases its hours of operation, its hourly wages and electricity bill will rise, but its rent and security alarm costs will stay the same (assuming that the business does not add additional locations). Start-up companies and other small businesses typically find it hard to pay all of the fixed costs that are part of their venture. Research shows that 70% of new start up businesses fail within the first 10 years. People have busier lifestyles in the 2010s, with more families having both adults working, and therefore they find it harder to find the time to physically go and shop at stores and services. As well, in many cities traffic jams and congestion on roads has made it more stressful and time-consuming to drive to physical locations to shop. Online shopping and online services, which consumers can access from an Internet-connected laptop or smartphone are more convenient for these people. With mobile devices, consumers can order take-out food, gifts and services even when they are "on the go", such as sitting on a bus or in an airport lounge. B&M increases the fixed cost for any business, therefore the products sold in physical shops tend to be more expensive compared to online shops. For stores selling expensive products or services in a B&M format, customers expect beautiful window displays, fine decorating in the establishment and well-dressed salespeople who earn high commission on their sales. Some high-end hair salons and luxury car stores even offer conveniences such as free espresso and bottled water, all of which add to the overhead of selling these products and services. Online shops, even those for luxury goods, do not have to pay for high-end retail stores and salespeople. Nevertheless, high-end online stores typically incur higher costs for their online presence, because they need to have leading edge Web 2.0 functions on their website, a professionally designed site, and in some cases, staff available to respond to phone calls, e-mails and online "chat" questions. Products may be out stock in relatively small brick and mortar retail stores and due to limited space in small business retail stores, these establishments may only be able to carry a few types of each product. Online shops are able to have a huge amount of stock in numerous large warehouses (e.g., Amazon.com has warehouses in numerous locations from which it ships its products) which it can quickly ship out. An online store may be able to order up products from a large number of geographically dispersed warehouses, even warehouses owned and operated by third parties (e.g., smaller companies), which are connected to the large company via the Internet. Queues (lineups and waiting rooms) are part and parcel of B&M retail businesses, due to physical constraints and the limitations on how many staff the business can afford to hire. A physical store may only have a few salespeople to serve customers, so many customers may have to wait in line during the busiest hours. To lessen the stress of waiting, some B&M stores provide big-screen TVs with cable TV, free coffee and newspapers; while these niceties improve the customer experience, they add to the costs of operating a B&M establishment. On the other hand, an online virtual store in which customers select their own purchases in a virtual "shopping cart" and pay for them using e-commerce approaches may be able to serve thousands of customers at the same time. Beginning in the 1990s and early 2000s, many governments in industrialized countries began to offer e-government services to citizens. Online government services are offered by a range of government departments and agencies, ranging from departments of motor vehicles (online car registration), police (paying speeding tickets online), city services (paying parking tickets online or requesting that a pothole be filled) and social services (registering for social assistance or unemployment insurance) and tax departments (paying a tax bill or submitting a tax return online). Many governments use e-services to provide online information to citizens (e.g., "help" guides, Frequently Asked Question lists, manuals for government program applicants, etc. ), thus saving on the need for call centers where citizens can call to ask questions or physical service locations where citizens can come in person to ask about government forms or services. These online government services aim at two goals: reducing costs to governments and improving client service. By offering these services and information online, governments save money, because they do not have to offer as many bricks and mortar client service centers where citizens can come and fill in these forms and pay government bills. Governments offering e-services can also operate with less civil servants and thus less salary and benefits costs, as the citizens using online services are generally doing all of the administrative tasks (e.g., downloading a form, filling in a form, looking up guidance in an online "help" manual, paying fees) themselves using their home computer. E-government services also improve service for citizens who have access to a computer, Internet and an online payment method (e.g., a credit card or PayPal), because these citizens are not limited by the 9 am-5 pm or 8 am-4 pm business hours of most physical government offices, and citizens do not have to incur the costs of transportation (e.g., bus tickets, gas, parking, etc.) associated with going to a bricks and mortar location. Nevertheless, government e-services do not help all citizens, due to the digital divide; citizens who are in poverty, who are homeless or who live in rural or remote regions may not have access to high speed Internet. These citizens, as well as those who are not comfortable with computers or those who do not understand how to use them, which in practice means elderly people, are not able to benefit from e-services. ↑ "What is bricks and mortar? definition and meaning". Investorwords.com. Retrieved 2012-11-03. ↑ "What is bricks and mortar? definition and meaning". Businessdictionary.com. Retrieved 2012-11-03. ↑ Chalabi, Mona. "McDonald's 34,492 restaurants: where are they?". The Guardian. The Guardian. Retrieved 29 October 2014. ↑ Anon. "Blockbuster to close remaining stores". BBC News. BBC News. Retrieved 29 October 2014. ↑ Butler, Sarah. "Shopping by smartphone and tablet in UK increases by 18%". The Guardian. The Guardian. Retrieved 28 October 2014. ↑ Walker, Brian. "Retail In Crisis: These Are The Changes Brick-And-Mortar Stores Must Make". www.forbes.com. Forbes. Retrieved 29 October 2014. ↑ Walne, Toby. "'We obviously do not make Barclays enough money': Dozens of branches to shut, despite bid to woo customers". This is Money. Financial Mail on Sunday. Retrieved 29 October 2014. ↑ Anon. "Improve customer service, Increase sales". Sage.co.uk. Sage. Retrieved 29 October 2014. ↑ Anon. "High Street V Online". Intersperience.com. Intersperience. Retrieved 29 October 2014. ↑ Shane, Scott. Illusions of Entrepreneurship: The Costly Myths that Entrepreneurs, Investors, and Policy Makers Live By. p. 99. Retrieved 29 October 2014. ↑ Lawson, Alex. "Shoppers 'hit the high streets with purpose' as footfall drops but spending rises". www.standard.co.uk. London Evening Standard. Retrieved 29 October 2014. ↑ Brownell, Matt. "5 Products You Shouldn't Buy Online". TheStreet Inc. Retrieved 30 October 2014.